The best Maui wedding beaches for privacy and beauty are in Makena in South Maui, near Wailea and Kihei. There is almost always sunshine and lots of beautiful, secluded white sand beaches. We make every effort to select a beach that is somewhat private, fairly easy to access, and is unlikely to have other weddings close by. For Maui sunset weddings, our favorite secluded beach is the Makena Surf end of Po’olenalena Beach. It has a paved parking lot, a paved sidewalk leading down to the beach, and a shower to rinse off your feet before returning to your car. It’s a large enough beach to find a private spot if there happens to be another wedding taking place. It’s also great for photography because it has black rocks for props, a long beach for “walking down the beach” shots, and silhouetted palm trees to enhance the background. For Maui morning weddings, we favor Makena Cove. Even though it’s a small cove with less privacy, for morning weddings it offers the beautiful, vivid turquoise ocean because of the white sand and clear water. It also has the beautiful black rocks and palm trees that make every photo postcard perfect. PHOTOS of Makena Surf Po’olenalena Beach for a sunset wedding. PHOTOS of Makena Cove for a morning wedding. A beach permit is required for all Maui weddings held on Hawaii’s beaches. Click here for more information. 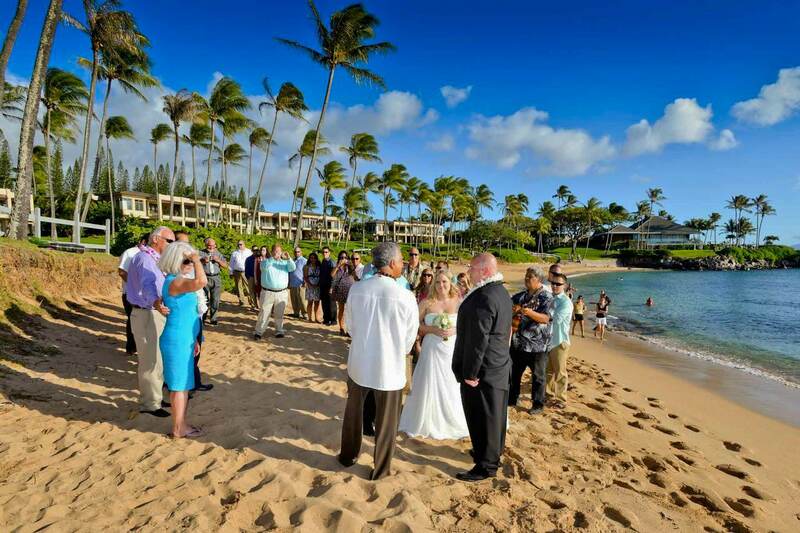 The best beaches for Maui weddings are in South Maui (Makena area) because of the seclusion and privacy, but if you are having a number of guests who are staying on the West side, you may opt for convenience over privacy. Please note that most vendors require a travel fee of $30-60 for the 2-hour round trip. 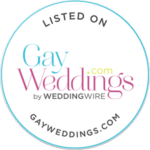 The best beach for weddings in West Maui is Kapalua Bay, voted “Best Beach in the World” by readers of Conde’ Nast Traveler magazine, as well as “America’s Best Beach” and “Best Beach in America”, among other honors. See photos of Kapalua Bay here. Another popular Maui west side beach is DT Fleming Beach. A few other Maui beach options are Ironwoods Beach Park, Lahaina Harbor, and Launiupoko Beach Park (beach name labeled under each image).